When it comes to moving and shipping, pallets are pretty important. They make heavy loads and shipments easier to load, unload, and move within warehouses, shipping containers, aircrafts, and trucks due to the structural support they provide. 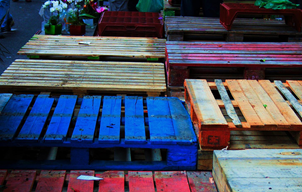 Pallets are primarily made of wood, but they can also be made from plastic, paper, and metal. Wooden pallets are strictly regulated in order to keep harmful foreign insects out of the United States and other countries. They need to be marked with the International Plant Protection Convention (IPPC) stamp to certify they have been inspected and are safe for use. There are two main types of wooden pallets, and they are known as stringer and block. 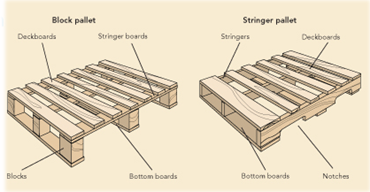 Stringer pallets have three long strips of wood to support the sides and middle of the pallet. They are also known as two-way pallets, because forklifts can only pick them up from two sides. Block pallets are made of parallel pieces of wood supported by blocks on the sides and middle of each edge. They are also known as four-way pallets, because forklifts can pick them up from any side. Block pallets are typically used for heavier loads, because more support is provided to the platform. There are several common sizes when it comes to pallets, and 40’’ x 48’’ is the most commonly used across the world, with 42’’ x 42’’ being the most common in North America, Europe, and Asia. It’s important to note that when measuring a pallet for a quote, the stringer length is always the first number. Pallets are incredibly crucial in the freight world, because they act as the base for almost every shipment. Since they’re shrink-wrapped or strapped down before stacking, they protect your goods from damage, truly making them a lifesaver.